If you are like me, you probably spend quite a bit of time online. We read news articles online, watch videos, plan vacations, shop and much more. At the same time, we are generating data that is being used to tailor advertising to our personal preferences. Profiles constructed from our personal information are used to suggest movies and music we might like. Data driven recommendations make it easier for us to find relevant content. Advertising also provides revenue for the content providers which allows us to access those videos and articles at reduced cost. But is the cost really reduced? How valuable is your data and how important is your privacy? Suppose you were sharing a computer with other members of your household. Would you want all your activities reflected in targeted advertising? Most of the time we are unaware that we are under surveillance and have no insight into the profiles created using our personal information. If we don’t want our personal information shared, how do we turn it off? To answer that question, let’s first see what is being collected. We’ll put a proxy server between the web browser and the internet to act as a ‘Man-in-the-Middle’. All web communication goes through the proxy server which can record and display the content. We can now see what is being shared and where it is going. The Privacy Settings of our Chrome browser allow us to turn off web services that share data. We also enable ‘Do Not Track’ to request that sites not track our browsing habits across websites. Let’s see what happens when we browse to the webpage of a popular travel site and perform a search for vacation accommodation. In our proxy server we observe that the travel website caused many requests to be sent from our machine to advertising and analytics sites. We can see requests being made to AppNexus (secure.adnxs.com), a company which builds groups of users for targeted advertising. These requests have used the X-Proxy-Origin HTTP Header to transmit our IP address. As IP addresses can be associated with geographic location this is personal data we may prefer to protect. 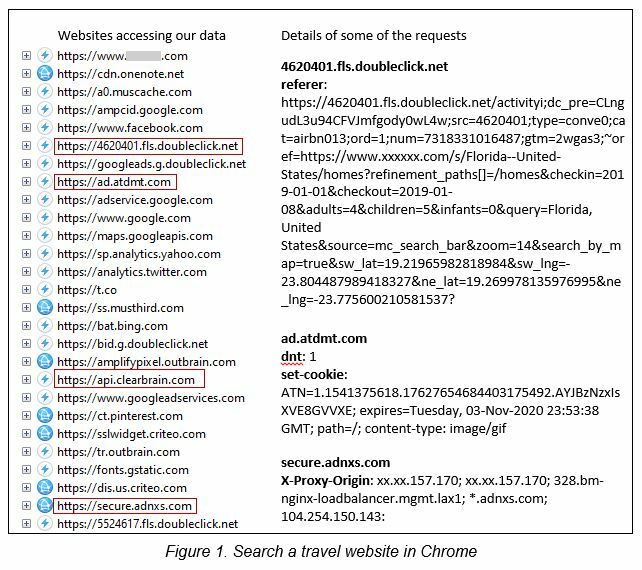 Both the Google Marketing Platform (doubleclick.net) and AppNexus are sharing details of the travel search in the Referrer HTTP Header. They know the intended destination and dates and the number of adults and children travelling. ATDMT (ad.atdmt.com) is owned by a Facebook subsidiary Atlas Solutions. 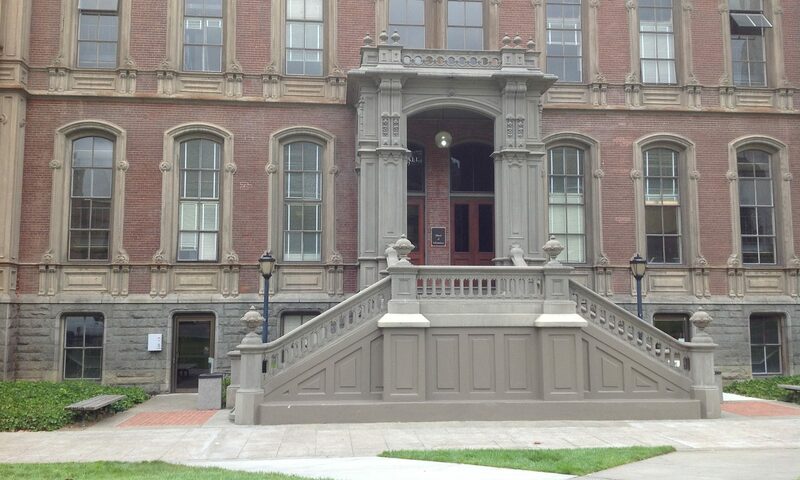 It is using a one pixel image as a tracking bug although the Do Not Track header is set to true. Clearbrain is a predictive analytics company which is also using a tracking bug. The Electronic Frontier Foundation’s ‘Privacy Badger’ combined with ‘Adblock Plus’ in Chrome. Privacy Badger is a browser add-on from the Electronic Frontier Foundation that stops advertisers and other third-party trackers from secretly tracking what pages you look at on the web. Adblock Plus is a free open source ad blocker which allows users to customize how much advertising they want to see. The Cliqz browser with Ghostery enabled. 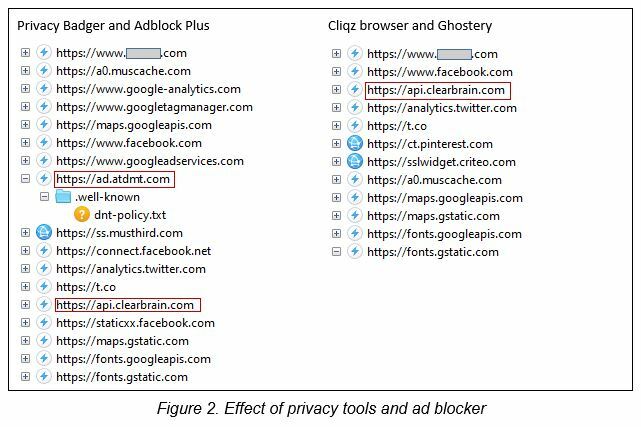 Ghostery is a privacy plugin giving control over ads and tracking technologies. Cliqz is an open source browser designed for privacy. There are now far fewer calls to third party websites. Privacy Badger has successfully identified and blocked the ATDMT tracking bug. Our IP address and travel search are no longer being collected. However neither Privacy Badger nor Ghostery detected the Clearbrain tracker. Since Privacy Badger learns to spot trackers while we browse it may just need to more time to detect bugs. While these privacy tools are quite effective at providing some individual control over personal information, they are by no means a perfect solution. This approach places the burden of protecting privacy on the individual who does not always understand the risks. While these tools are designed to be easy to install, many people are unfamiliar with browser plugins. Furthermore, we are making a trade off between our privacy and access to tailored advertising. Content websites we love to use may be sponsored by the advertising revenue we are now blocking. For now, these tools at least offer the ability to make a choice.